Western Wide Receiver Jordan Smith scored two touchdowns and the eventual game winner to help his team advance to the second round of the playoffs on Deerfield Beach’s homefield. The Wildcats from Davie, FL defeated their Broward County foes for the first time ever here in 2017 by a 20-17 final score. 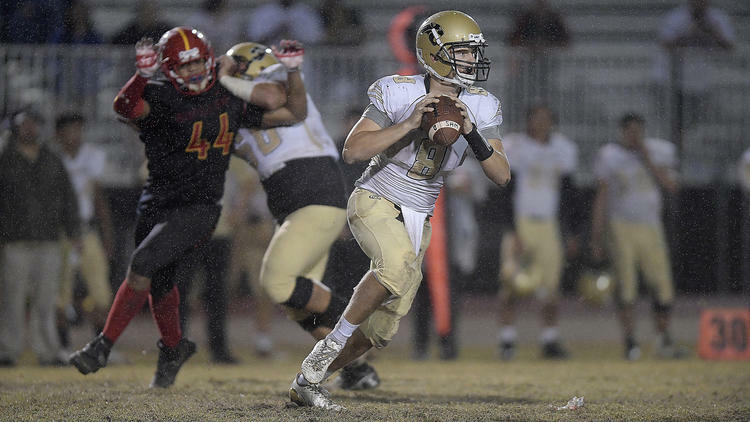 In a game drenched by rain, the favorite to win Class 8A Deerfield Beach could not hold on to the football. The Wildcats pounced on several turnovers and controlled the football for most of the game keeping the Bucks offense off the field. The storybook season for Western continues with their quarterback Harrison Story leading the way. Story punched in their first touchdown from one yard out after Deerfield’s star running back Jaylan Knighton scored the game’s first touchdown. Knighton would counter with another electrifying 49-yard run on the ensuing drive. Deerfield would settle for a field goal and take a three point lead into halftime 10-7. Story would engineer a methodical drive at the start of the second half that would end with the first of Smith’s touchdown catches giving the Wildcats the lead 13-10 that they would not relinquish. Western will face Palm Beach Central next week who have shutout their last four opponents by a combined score of 136-0.